The fact that consumers buy more vegetables and fruits is good from the point of view for a healthy diet and a sustainable lifestyle. 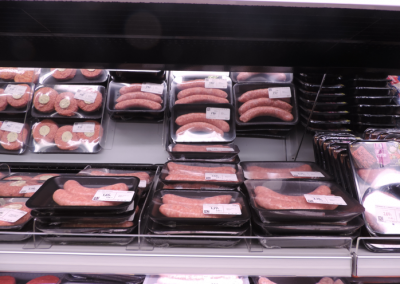 However, products that are not seasonal but continuously available in the supermarket, require longer preservation in refrigerators compared to products offered in season. Moreover, when vegetables and fruits are processed out of their season, more production efforts are needed (e.g. heating and transportation), resulting in a higher environmental impact. Because consumers often lack know-how about the seasonality of fruits and vegetables, providing information on the growing seasons may solve this problem. Yet, the success of extensive and similarly expensive communication and information campaigns is questionable. 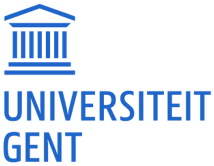 The aim of this research is to increase sales of seasonal vegetables and fruits, by unobtrusively nudging consumers towards these particular products. 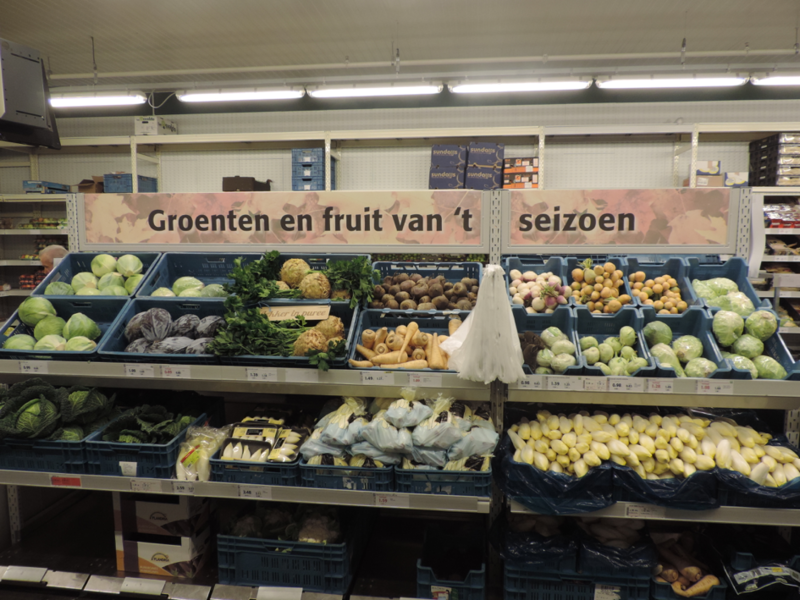 During a one-month intervention in a large Belgian supermarket store, four interventions were combined to increase the sales of seasonal products. First, a priming manipulation was used to increase the overall perception of tastiness of seasonal products, by applying shape mimicry on a particular seasonal product (walnuts). In general, consumers perceive healthy products (i.e., vegetables and fruits) as less tasty than unhealthy products (i.e., junk food). Tastiness perceptions can be enhanced when a healthy product mimics the shape of an unhealthy one. Therefore, presenting walnuts as popcorn with the tag line ‘the best of the season’, improved tastiness perceptions (as tested in a pre-test). Two posters with shape mimicry pictures and the tagline ‘the best of the season’ were pinned on a clearly visible place on the shelves of the seasonal products. Second, to enhance the accessibility of seasonal products, all seasonal products were placed together on a central block of shelves in the fruits and vegetables department. 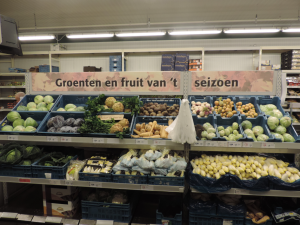 Third, to improve the implicit knowledge of seasonality among consumers, a large sign was used to indicate that the products on the central shelves were seasonal products. No explicit mentioning of health or sustainability were made. Finally, a product-specific intervention was created by adding a sign with a suggestion of preparation (tasty with mashed potatoes) for the seasonal product celeriac. As consumers always feel a certain amount of time-pressure when doing their groceries, recipes or preparation suggestions assist in lowering this pressure while increasing purchase intentions. The sign was made of wood to enhance environmental friendly feelings. 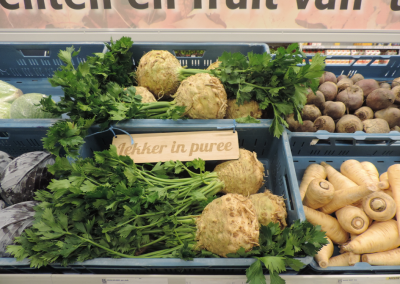 The sign was attached on the box wherein the celeriac was presented to the customers. Purchase records of the preceding year (same month) served as benchmark for the sales during the intervention period. To further strengthen the findings, results were compared to the purchase records of eight comparable control stores, where no intervention was applied. These stores did have central block with products (which may be seasonal), but no sign of seasonal products or posters were applied. Following the same procedure as outlined for the experimental store, purchase records of the preceding year (same month) served as benchmark to analyze the relative development in sales in the control stores. Finally, results are reported separately for fruits and vegetables, as fruits were sold by a fixed price per gram (grapes, apples, and pears) and vegetables by a fixed price per piece (celeriac, parsnip, chicory, and different types of cabbage). First, to determine the effectiveness of the shape mimicry poster and the sign that indicates the seasonality of the products on the central shelves, the sales of all products that were placed on the central shelves in both the experimental and control stores were compared. Thus, in this analysis, we filtered out the effect of placing the products on the central shelves, and assess the incremental effect of adding the shape mimicry poster and the sign. For seasonal fruits (pears and grapes), the poster and sign did not influence purchase behavior. Compared to the control locations, the relative increase of the sales of fruit in the intervention store was only one percentage point higher. Contrary, the relative increase of the vegetable sales (cabbages) was 25 percentage points higher in the intervention store than in the control location. We suggest that these results can be explained due to the differences in the association strength between the specific products and seasonality. For example, in October, cabbages are perhaps more strongly associated with the autumn season in comparison to pears and grapes. Second, we analyzed the efficacy of placing all seasonal products more centrally in the fruits and vegetables department. Therefore, a comparison is made between products that were placed on the central shelves in the intervention store, but not in the control location. However, this analysis also includes the effect of the shape mimicry poster and sign in the experimental store. The central position of seasonal fruits (apples) combined with the poster and sign, resulted in a 19 percentage points increase in sales compared to the control location. Thus, we suggest that central positioning may work better for seasonal fruits (if weakly associated with the season) than adding posters and signs. 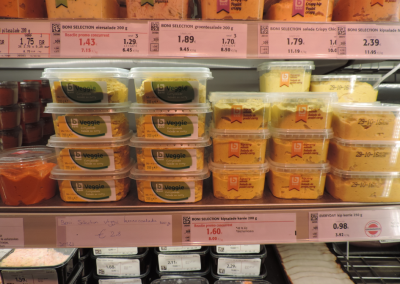 The central shelves also increased the purchase of vegetables (chicory and parsnip) with a relative development of a 29 percentage points increase in sales compared to the control location. Finally, the suggestion sign increased the sales of celeriac by 27 percentage points compared to the stores where no sign was attached. Consumers were more inclined to buy seasonal products because of (1) the applied priming mechanism, (2) the enhanced accessibility and (3) the improved implicit knowledge about seasonality. However, the total amount that consumers spent on vegetables and fruits (be it seasonal products or not) was identical to the amount they spent the year before. Thus, consumers did not buy more vegetables and fruits, but shifted towards more seasonal products. Finally, adding tag-line signs with preparation suggestions (4) for a particular product increased the sales of the targeted product. 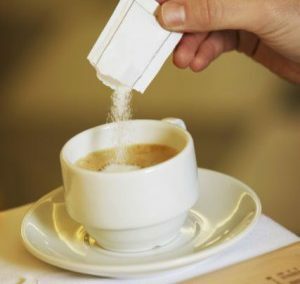 Since this nudge is open to variety, this intervention can be used in various ways to temporarily boost the sales of a particular seasonal product. There has been given access to a blog post about this nudge. Here you can find more relevant information about the nudge. Bublitz, M.G. & Peracchio, L.A. (2015). Applying industry practices to promote healthy foods: An exploration of positive marketing outcomes, 68, 2484–2493. Wansink, B., Just, D.R., Payne, C. R., & Klinger, M. Z. (2012). Attractive names sustain increased vegetable intake in schools. Preventive Medicine, 55, 330-332. Wijk, R. A. De, Maaskant, A. J., Polet, I. A., Holthuysen, N. T. E., & Van, E. (2016). An In-Store Experiment on the Effect of Accessibility on Sales of Wholegrain and White Bread in Supermarkets, Plos-one, 1–8.